Neck Headache, or as it is known medically - Cervicogenic Headache, is a secondary headache disorder. In other words, your headache is caused by a neck joint problem. What's Causes Your Neck Headache? Your neck headache can originate from a variety of musculoskeletal and neurovascular structures in your upper neck; including the upper three neck joints, C2/3 disc, spinal cord coverings and neck muscles. 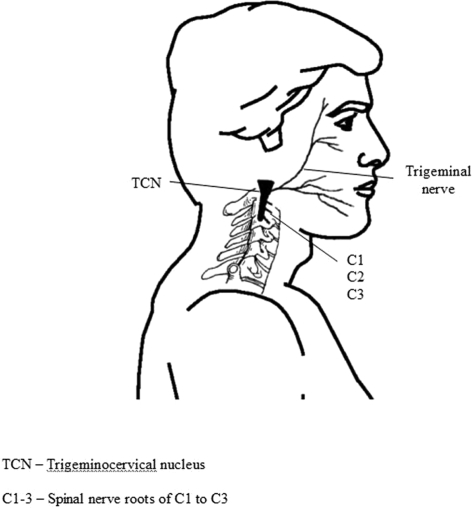 A dysfunction in these areas can trigger pain signals that travel to your trigeminocervical nucleus (TCN) in your brainstem. This information is then transmitted into your brain and interpreted as a headache (Bogduk 2003). The most likely sources of your neck headache is dysfunction of either your upper neck joints, neck muscles or nerves, which trigger pain signals that travel to your trigeminal nucleus in your brainstem, where you interpret the pain signals as a neck headache. In simple terms, your neck joints can cause a neck headache or pain if they are either too stiffor move too much (eg wobbly and unsupported by weak muscles) or are locked in an abnormal joint position eg. locked facet joint or poor posture. 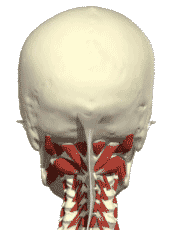 Once your neck joint becomes stressed and painful, the pain signals are referred to the trigeminocervical nucleus in your brainstem... and you start to feel a neck headache or, in some cases, face pain! Your physiotherapist is expert in the assessment and correction of neck joint dysfunctions that result in neck headache. Their professional diagnosis and treatment is essential for neck headache sufferers. Your neck and shoulder blade muscles that originate from your neck will cause pain if they are overworking, knotted or in spasm. Some of your neck muscles overwork when protecting injured neck joints. Other neck muscles become weak with disuse, which places further demand on your overworking muscles resulting in muscle fatigue related symptoms. Your neck muscles work optimally when they have normal resting tension, length, strength, power and endurance. Your physiotherapist is expert in the assessment and correction of muscle imbalances that result in neck headache. Nerves in your upper neck may be directly pinched by extra bony growths eg arthritis, disc bulges or swelling. The results can result in nerve irritation or a reduction in neural motion known as neuromechanosensitivity or abnormal neurodynamics. Irritation of your upper neck structures refer pain messages along the nerves and cause your headache. In simple terms, your neck is the "switch", nerves are the "power cords" and your headache is where the "light" comes on. What are the Symptoms of Neck Headache? Neck headaches can often be misdiagnosed or confused with other sources of headache, including migraine, since the head pain is typically felt in the same area as a migraine. Tenderness at the top of their neck and base of the skull. Neck stiffness or a mild loss of movement, although this is sometimes is only subtle and needs to be confirmed during your physiotherapist's physical examination. One of the main differences between neck headache and migraine is that physiotherapy treatment of your neck is able to alter or relieve your headache immediately. Common Characteristics of a Neck Headache? Your headache may seem to radiate from the back to the front of your head. Your headache is provoked or eased by a neck movement, a sustained posture, stomach sleeping or with your head turned to one side. Your headache normally appears to be worse on one side of your head. The side is normally constant and does not swap sides. Your headache appears to temporarily ease up when you apply pressure or you massage your neck or the base of your skull. If you experience any of the above symptoms, you are more likely than not to be suffering a neck headache. Please inform your physiotherapist and they will assist you. What if Your Neck Isn’t Sore? Even if your neck isn’t sore or painful, you can still experience neck headaches. It is important to remember that your neck joints may NOT be sore at REST, but they may be tender to touch or painful on movement. Neck joints that are sore at rest will normally be very tender to touch and painful at the extreme of movement. Obviously, this scenario is a more severe neck headache. If your headache or a migraine has been present for years and your neck has not been examined, then a thorough neck examination is recommended and is appropriate to eitherconfirm and treat your neck headache or exclude a neck disorder as the cause of your headache. How is a Neck Headache Diagnosed? Accurate diagnosis is important to guide the correct treatment and management your neck headache. Headache and head pain can have many causes, not just neck headache or migraine. Correctly identifying the cause will lead to better treatment. This article originally appeared p physioworks.com.au and was written by John Miller.